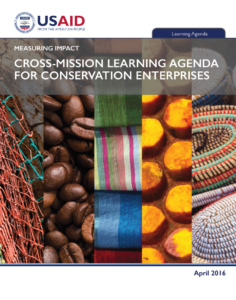 Description: This learning agenda explores the conditions under which conservation enterprise strategies are successful in achieving desired outcomes, and why, in order to improve USAID’s biodiversity programming. Full citation: Measuring Impact. 2016. Cross-Mission Learning Agenda for Conservation Enterprises. USAID Office of Forestry and Biodiversity/Bureau for Economic Growth, Education, and Environment.